Michael Brown, killed by police in Ferguson, Missouri, was described as "no angel" by the New York Times. On St. Patrick's Day, Maryland white supremacist James Harris Jackson drove to New York City for the express purpose of killing black men, authorities say. After wandering around the city for a few days, he did just that, approaching Timothy Caughman, a 66-year-old African American, and repeatedly stabbing him in the chest with a 26-inch katana sword, according to police reports. As revelations about Jackson's motives broke, two major New York outlets chose not to dig into the past of the 28-year-old suspect, but to smear the victim. "[Caughman] has 11 prior arrests, including for marijuana, assault, resisting arrest and menacing," the New York Daily News reported of the victim, after describing the assailant as "dapper." "Caughman, who has 11 prior arrests, walked for about a block after the stabbing and staggered into the Midtown South Precinct, looking for help," the New York Post said. "Police sources said the career criminal was refusing to talk to police about the incident and acting combative before his death." "Career criminal" — this is how the seventh-largest paper in the U.S. saw fit to describe a hate crime victim mere hours after his slaying. The Daily News also bizarrely brought up the 2014 killing of NYPD police Officers Wenjian Liu and Rafael Ramos in an attack attributed to Baltimore resident Ismaaiyl Brinsley, an African American. The implication being that these two crimes were, somehow, related. Police often will provide the criminal history of those they’ve been accused of killing, while the officer in question hides snugly behind anonymity. Social media was understandably outraged. "This innocent Black man was randomly killed by a white supremacist terrorist, and the NY Daily News chose to mention the VICTIM'S record," Tariq Nasheed tweeted. Even Daily News columnist Shaun King would go on to condemn his employer, writing: "I am utterly disgusted to see stories here in the Daily News reporting the criminal history of 66-year-old Timothy Caughman." But the damage was already done, and such treatment of black victims is far from uncommon. In the case of Trayvon Martin, the 17-year-old shot to death in 2012 by a neighborhood watch volunteer, Fox News criticized the victim's clothing choices, while the Miami Herald felt the need to dredge through his school suspension records. A now-infamous New York Times profile of Michael Brown, the unarmed teenager killed by a police officer in Ferguson, Mo., insisted the victim "was no angel," despite no one ever having suggested he was. 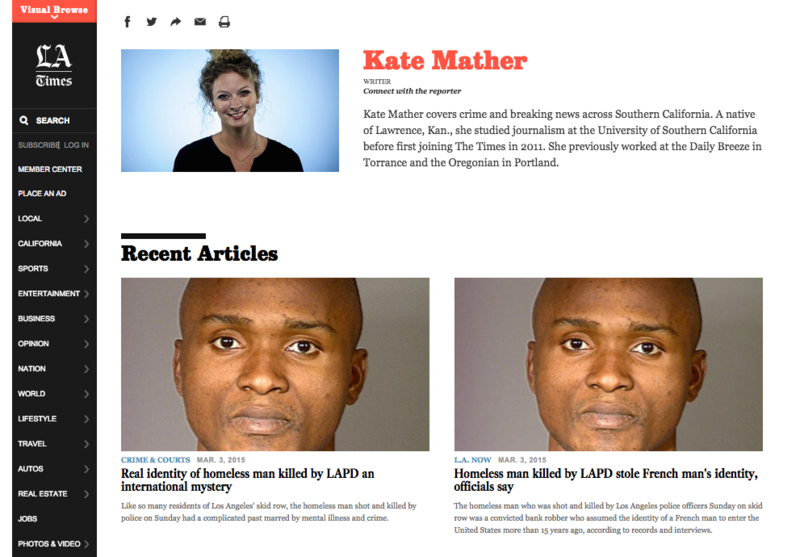 When the LAPD shot and killed homeless man Charly "Africa" Keunang on skid row, this newspaper brought up the victim's prior bad behavior and published his mugshot on its website. The day after Chicago police Officer Jason Van Dyke was charged with first-degree murder for the 2014 killing of Laquan McDonald, CNN said on Twitter that the victim had led a "turbulent life" and noted that the teen had been "abused." Just one more example: After Otis Byrd was found hanging from a tree in Mississippi in what some feared was a lynching, CNN noted that he'd been convicted of murder 35 years previously. His death later was ruled a suicide. The inverse is also true: White terrorists or mass shooters are reflexively humanized and shown in shades of gray. Dylann Roof, convicted of fatally shooting nine church goers in South Carolina, was said to have "drifted off track." He was called a "quiet loner" who was simply "caught in internet evil." One major problem, especially in the case of police shootings, is that there's an information imbalance in the victim's disfavor: His identity is known, while the police officer's is sealed. This encourages the media — absent any solid information about the case — to dig into the victim's past. How else can reporters fill their column inches? The police often will provide the criminal history of those they've been accused of killing, while the officer in question hides snugly behind anonymity. Police departments, moreover, often have millions of dollars at their disposal for public relations, while the families of those killed do not. Law enforcement also has existing relationships with local media, while, again, the families of those who have been killed have no such advantage. Yet another factor is the undeniable undercurrent of racial bias, both conscious and subconscious. Newsrooms remain overwhelmingly white — roughly 83% — which means those who are responsible for making quick judgment calls about editorial priorities and headlines may fall back on lazy, racist assumptions. It's darkly fitting that media coverage is one reason why Jackson, who stands accused of such a heinous crime, chose New York over his native Maryland: "Jackson told police that he picked New York," CNN reported, "because it is the media capital of the world and he wanted to make a statement." As it turned out, New York media provided him better coverage than he probably expected. Adam H. Johnson is a media analyst for Fairness and Accuracy in Reporting.